It's a prototype at the moment, but it looks like Ken MacBeth's touch keyboard synth could be a goer. It's well-documented that the iPad's multi-touch interface has brought about new ways of playing synths, but now we have a prototype of a hardware instrument with its own touch keyboard built in. 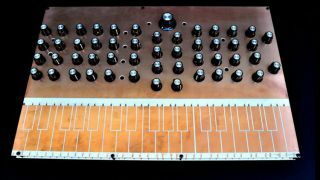 The brain child of modular synthesis maestro Ken MacBeth, the as-yet-unnamed instrument was revealed via Facebook at the weekend. Of the new design, MacBeth says that it has "four oscillators, two noise generators, one LFO, a dual stage variable filter, four envelope generators, two VCAs (Stereo) and a stereo tape delay". It seems that this synth is something that Ken has had in mind for a while, too: "It's been a long term development over years," he says. "The micromac series has been designed for those who wish for the vintage 'Moog-like' sound - this is a completely different design!" No news on when we can expect the synth to come to market, but we'll be monitoring its progress.